Years ago I lived in San Jose with my grandfather and one of my best friends lived downtown while attending SJSU. Ah, the memories of wandering downtown after a beer or 5, hanging out listening to bands at the Cactus Club or the Agenda. On other less alcohol fueled nights we would cruise around the downtown area on our bikes and rollerblades. Watch out for the light rail tracks! For some reason, the Adobe building always caught my eye. I don’t know if it was the way it stood out at night like a white monolith in celebration of technology’s victory over the Valley or if it was just all of the glass and reflection. 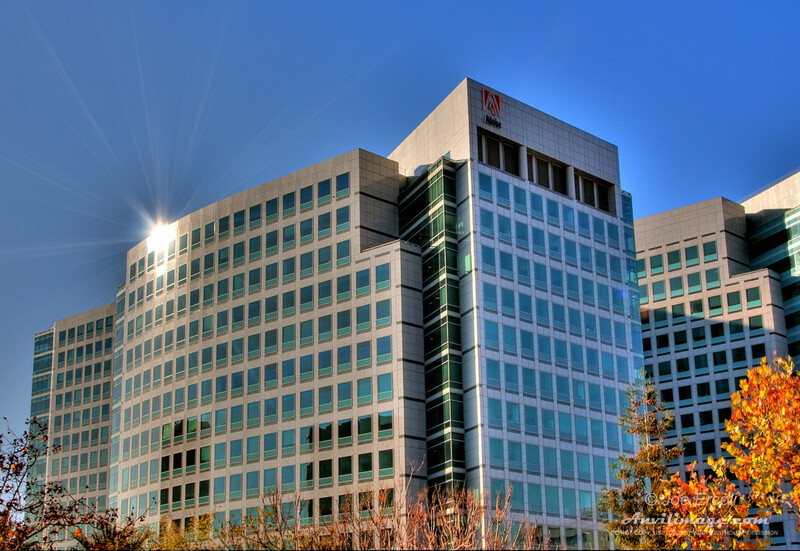 I was always keenly aware of the Adobe building and used it often as a landmark well before I was into computers and knew what the company did! On a recent trip downtown with Jen, I also had my camera and was taking pics of a few things around the Tech Museum. I just had to find spot to capture the building’s image and she patiently (as always!) followed me on my hunt to find the best spot. Heh! I finally settled for this and even though I no longer live in San Jose, this image makes me feel like I’m coming home again. This entry was posted on Wednesday, December 17th, 2008 at 11:46 pm	and is filed under Blog, Photos. You can follow any responses to this entry through the RSS 2.0 feed.